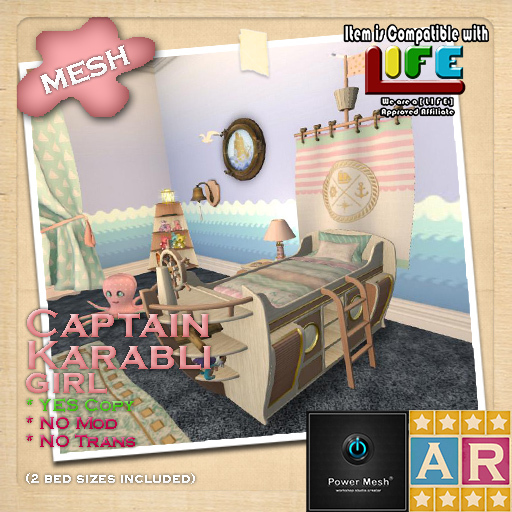 Super beautiful room princess themed, soft colors, fabric texture changing script (4 colors to choose: pink, lillac, blue & neutral) to personalize it, interactive with friends and family, LIFE hud items compatible, 2 bed sizes included (toddler & kid/teen). Very to complete to decorate a royal suite. Wonderful and classy bathroom set designed specially for princesses (but it fit perfectly to all the family), this beautiful comes with all you need to make your roleplay experienced as most complete and interactive as possible. 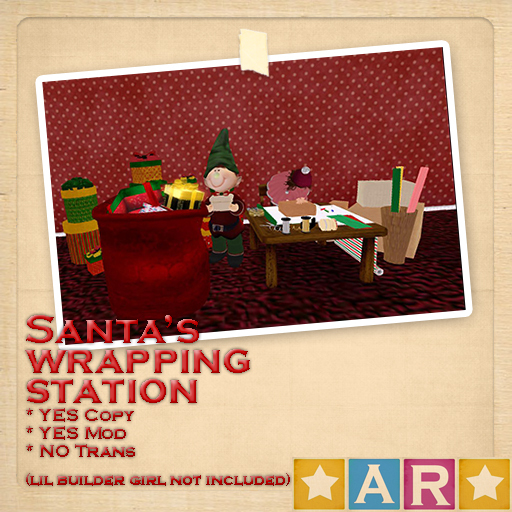 All furniture fit 3 avatar sizes: toddler, regular kid and teen (parents can use it also in this option). 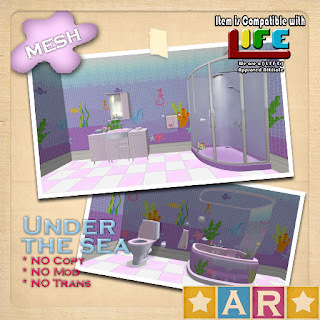 Includes: Bathtub, toilet, shower, changing station and sink (all them with single animations, and parent-kid animations in the toddler menu), also comes with all decoration display in the picture and in * AR * store in world at Serenity Bay. Captain Karabli it's a very exclusive room made in collaboration of *AR* (Anjelika Rexen) & Power Mesh (cta2s Doghouse). Designed with all that a little explorer of the seas can need for have fun and delightful moments with friends and family. Availabe in [ L I F E ] & regular version. 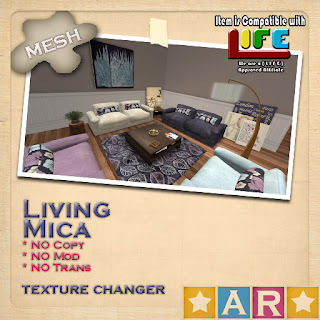 Living Mica is a totally versatile living room set, perfect for any house, it is full of features that will make your roleplay activity funnier, you can change textures to make it match your decoration. It is availble in 2 version: regular (copy, mod, no transf) y life (compatible with life hud, no copy, no mod, no trans). Nora Bigs, fresh, simple and cozy room for parents and/or teen girls, blues & greens will gives your room a perfect ambiance to play and share with friends & family. It is availble in 2 version: regular (copy, mod, no transf) y life (compatible with life hud, no copy, no mod, no trans). 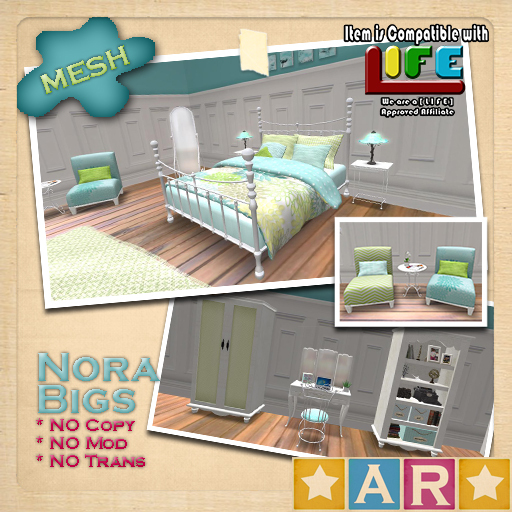 The small version of Nora Bigs, fresh, simple and cozy room for girls, blues & greens will gives your room a perfect ambiance to play and share with friends & family. 3 size of bed included. 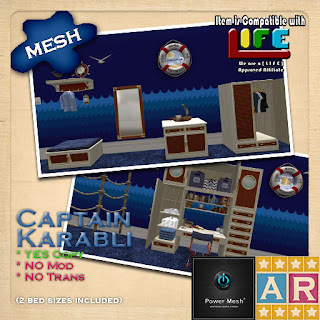 It is availble in 2 version: regular (copy, mod, no transf) y life (compatible with life hud, no copy, no mod, no trans). Little Ellie, super cute pinkish room, ideal for spend time with friends and family, the little elephants and the paisley print will give a fresh and bohemian ambiance. 3 size of bed included. 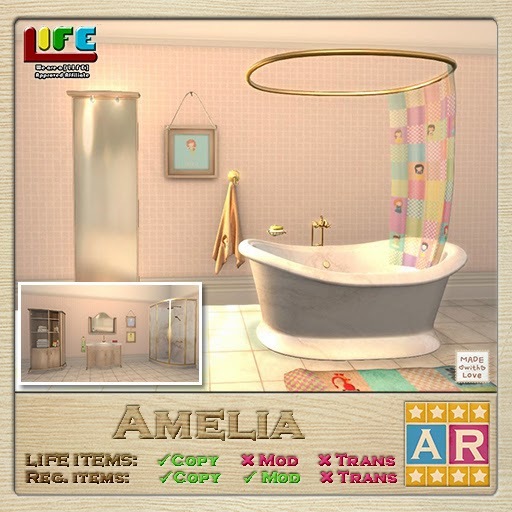 It is availble in 2 version: regular (copy, mod, no transf) y life (compatible with life hud, no copy, no mod, no trans). Specially designed for the young of the family (toddler, kid & teen). 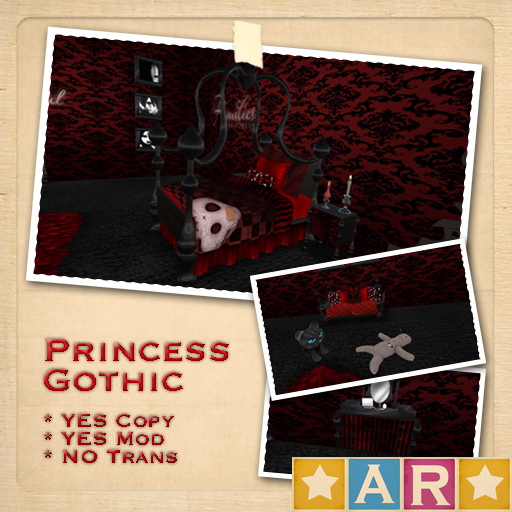 This set comes very complete with all the furniture and accessories needed for a functional room. It is availble in 2 version: regular (copy, mod, no transf) y life (compatible with life hud, no copy, no mod, no trans). The perfect adition for toddlers bed to keep them safe during the night. 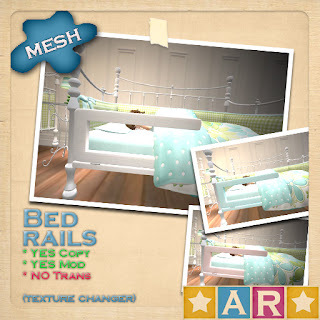 Comes with texture changer to match most of *AR* sets. Specially designed for the little boys, Princes and Knights of the house, this bedroom set comes with all you need for spend quality and fun times with your friends and your family. Floor and wall textures included. Perfect for an interactive experience with your family and friends. Are you or do you have a teenager sister? auntie? bbf? Chloe it is the perfect room =) specially designed for teenagers this is a very colorful and messy set, the bed allows you to spend time alone, with your friends, cuddle with the special one (PG) and also spend time with your little sister/brother/niece/nephew, ideal also for a study night or just to hang with friend in the rug. It is a very complete set and comes fully decorated, for sure a must in any teenage girl in family rp. Do you like ballet? do you love pink? Hannah is for you! This gorgeous and super chich bedroom is for the little ballerinas, totally princess look and fully animated this set is perfect for have memorable time and experiences with your family and friends, the ballet stage gives a totally unique and exlcusive touch and allows you to spend times and times of joy. And for the babies here are the changing station and the babybath. The very first room for parents specially designed with the cutest animations for interact with kids, it comes with menu for single parent, friends (PG 2 adults), couple (PG cuddles) and parent-kid. Bed and lounger support until 2 parents and 2 kids sit at same time. This is a must for family role players. New brand room for boys, elegant and classic, perfect for little gentlemen or princes, this wonderful room comes with an interactive car bed, telescope to watch the stars (glowing stars in ceiling and wall turn on/off automatically at state time), chair for spend time with parents, interactive rug, desk, bookcase and interactive pillows, nightstand and lamp, plus wallpaper and rug texture included for a perfect look. Are you a baby and you need the changing table and baby bath for Mia Room? 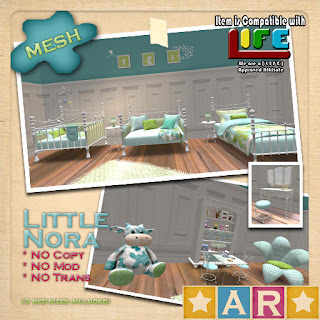 Well thinking in your need *AR* released the perfect complement for make a complete Mia Nursery. Comes with 2 options of changing table, shelf, bin and babybath. Fully interactive with parent. A perfect couch designed for you spending time with your parents, the clean design allow it to match almost every style. 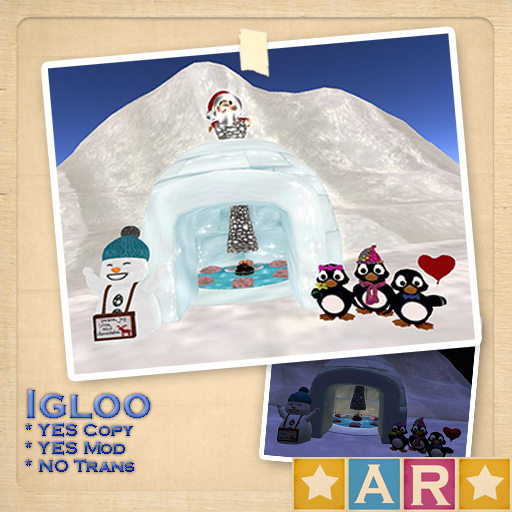 Includes: 6 animations for 1 parent 1 kid, 4 animations for 2 parents 1 kid, and aditional animtiono for an extra kid. Really the best living/family furniture for a kid been spoiled by parents. Mia is a beautiful peaceful room, elegant, modern, classic, can match perfectly any style, all in white/cream tones, comes with 3 size of bed (crib for babies, daybed for toddlers and bed for kids). Sawyer is an animals themed room, comes with 3 bed sizes (babies, toddlers and kids). Perfect for the kids growing or for a shared room, can fit perfect boys and girls that likes greens, blues and browns. And for complement it, the activities table, perfect for chat with friends or coloring, the little elephant is a rezzer that will provide you and your friends a menu with tea, colors and dough. A beutiful and original cozy and warm Christmas themed bedroom. Beautiful frozen space ideal for have time with family or friends, or just for use as winter playhouse. Thanks to all of you for your preference and for allow *AR* be part of your second life, for 2 years now =)), thank you for allow me to be part of your homes and family through my furniture. My biggest commitment is to have happy clients, and i will continue making my best effort to give all of you innovating and good quality products. 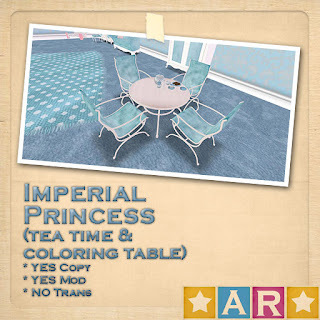 A new lovely room for princesses, blueish ambiance is perfect for any season, fresh for spring and summer, and cold/frozen look for winter. 2 options of bed included (one normal bed, one crib) so babies and kids can use it, even big and lil sissy can share room. The tea time and colouring table it is not included BUT it is set as Group Gift in the back of the entrance wall. A lovely new room for all the lovers of purple and/or pandas, this gorgeous room was designed for lil girls but this time added also crib and rocking chair for babies, this is the perfect set for babies growing to toddlers, or sisters (big and small) sharing room. ★ Wallpaper and carpet texture included for complete the look. Includes: Bed, Crib, 2 Panda plushes, Vanity, Bookcase, NIghtstand, Rug, Decorative frames, Chaise longue, Rocking chair and Lamp. 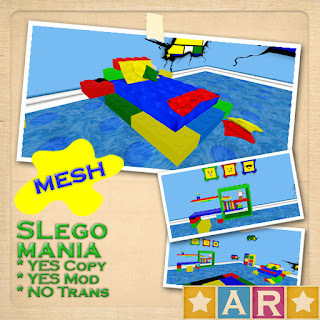 * AR * brings to you a totally new room lego inspired, super fun and colorful, designed for boys but perfectly can work for girls also, all made by slego pieces. Fit any kid size (adjusted with 1.00 mt avi size). Allo everyone ^_^ this week is turn of the lil vampies, gothic, darkies lil girls, or just for those who wants a perfect ambiance for Halloween, beautiful and elegant room in black and red, perfect fit for any size kid and fully interactive for parents and friends. Interactive animated: Bed, sofa, rug. Wallpaper and carpet texture included so you can make your room looks exactly like the one at the store ^_^ (Includes also the old version). Don't forget * AR - Cozy's * members obtain 50% discount while the room is at the showcases inside store, after that 15% in all vendors of Happy Feet store. Ok very looong time since i released a room a due i still not computer back i can't make much things yet, however this week i will start updating some of my old rooms, If you already got them your will receive the update soon)* and if you didn't get yet maybe you want to give a second chance to the new versions. Gorgeous bedroom furniture set for girls, princess room inspired, emo pinkish themed. 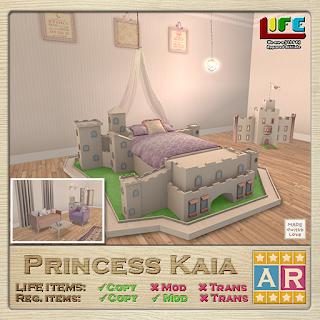 Princess Pink room small version now contains interactive animations for parents and friends and fits perfect for all kids size (including all little mesh bodies). ❀ AR- Miss LadyBug - This Miss LadyBug Tot Set includes tot bed with rails on side theme in ladybug, dresser, wardrobe, rug, shelf, rocking bug, nightstand with lamp, Big LadyBug plush, vanity with stool, tea table set. Theme Wall Art. also comes wallpaper texture and carpet texture. This Set adjust perfect to your yabu mesh baby avi and cartoon toddler, and allows you to interact with parents and friends. ❀ AR- Sailor - This Sailor Tot set includes a tot bed with rails on side theme in sailor, bookcase,nightstand, rug, rocking boat, little light house lamp for nightstand, wall unit to sit with friends and family, Whale chair. This Set adjust perfect to your yabu mesh baby avi, and allows you to interact with parents and friends. 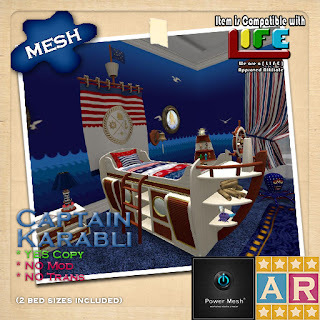 ❀ AR - SuperKid Boys Set - This is a superkid Bedroom set includes a bed with the logo of superman on it and bed comes fully interactive animations,pillows,rug,desk,dresser,posters, nightstands,chair,wall texture and carpet texture. 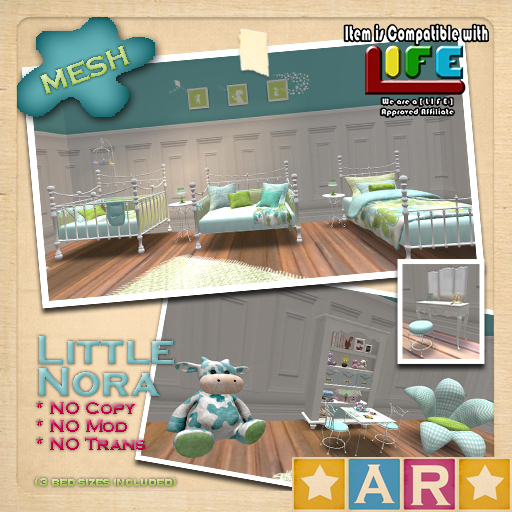 ❀ AR- Flutterby Nursery: This Baby Girls Nursery Set includes a baby crib, also comes with a baby tree swing, rocking chair, wardrobe,rug, playpen,snail, bath table, changing table, also comes with wallpaper and floor texture. 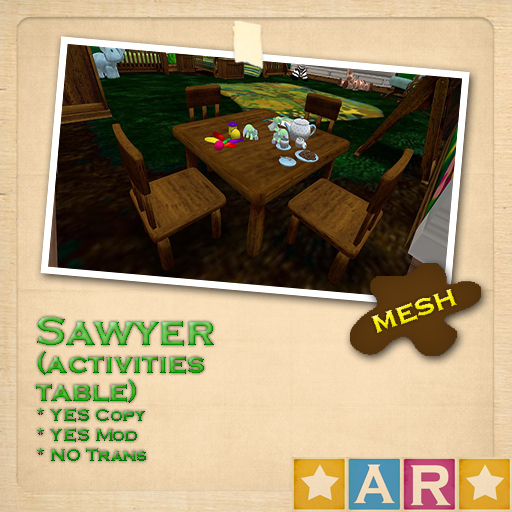 This Set adjust perfect to your Yabu-Toddleedoo-CK Mesh Baby Avi, and allows you to interact with parents and friends.